CDN Print Plastic is a fully authorized Canadian reseller for all Pointman card printers. 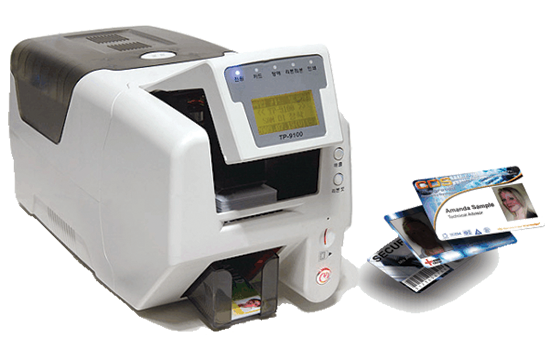 The TP-9200 ID Card Printer offers flexibility to your daily card printing needs. TP-9200 Card Printer is fully capable of printing up to 210 Full-Color (16.7 Million Colors) ID Cards per hour. The printer is able to accomodate your needs when printing a batch of cards, using the printer's 100 card input hopper, you are able tto pre-load 100 cards. The printer also comes with a single-feed option where printing is made easy for a single card using ATM type card input. The printer's 1GB of RAM is able to handle any design load onto the printer and promise a fast and clean print. Pointman TP-9200 is like most other ID Card Printers, it uses a Direct-To-Card Dye-sublimation printing method and is able to print full color Edge-to-Edge ID Badges. The printer also comes with an easy to use ID Badge Design software called "TheDesigner". Replacing the ribbon and loading the cards has never been easier, look for the Operations Manual in our Media section.